NYC, 02/26/2019, 5:30PM. 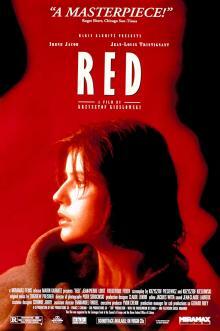 Three Colors: Red (1994): Last movie of the trilogy by Kieslowski. A model discovers her neighbor is keen on invading people's privacy. 99 min. Starring Irène Jacob, Jean-Louis Trintignant, Frédérique Feder. It is the final installment of the Three Colours Trilogy, which examines the French Revolutionary ideals. It is preceded by Blue and White. Red was released to universal critical acclaim, and was nominated for three Academy Awards, including Best Director for Kieślowski. Kieślowski had announced that this would be his final film, which proved true with the director's sudden death in 1996.